We’re delighted to announce that we’re co-organizing a new monthly Twitter chat with Reckoning Press! 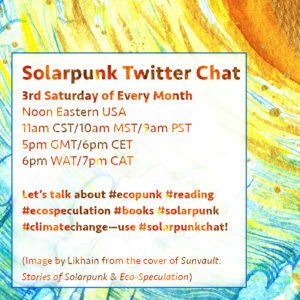 In broad strokes, a monthly conversation will consider the ideas of solarpunk, hopepunk, ecopunk, eco-futurism, eco-fiction, and climate fiction. Collectively, these terms refer to environmental science fiction, art, and activism that to varying degrees combine the green movement, renewable energy sources, intersectional social justice, and global climate justice movements, and the anti-capitalism and do-it-yourself ethic of the punk movement. While critics, audiences, and creators have not yet settled on a single label for these works, and disagree on whether a label is even helpful when imagining better ways of being, we needed to choose a chat hashtag so people could find the conversation. Thus #SolarpunkChat was born! For the first #SolarpunkChat, on Saturday, March 17th (St. Patrick’s Day), Reckoning Magazine‘s Michael J. DeLuca and Sunvault contributor Brandon Crilly will lead a conversation on “Hopepunk And Resistance.” We’ll focus on speculative fiction and art as tools for imagining optimistic futures, and then discuss practical actions to help us get there. 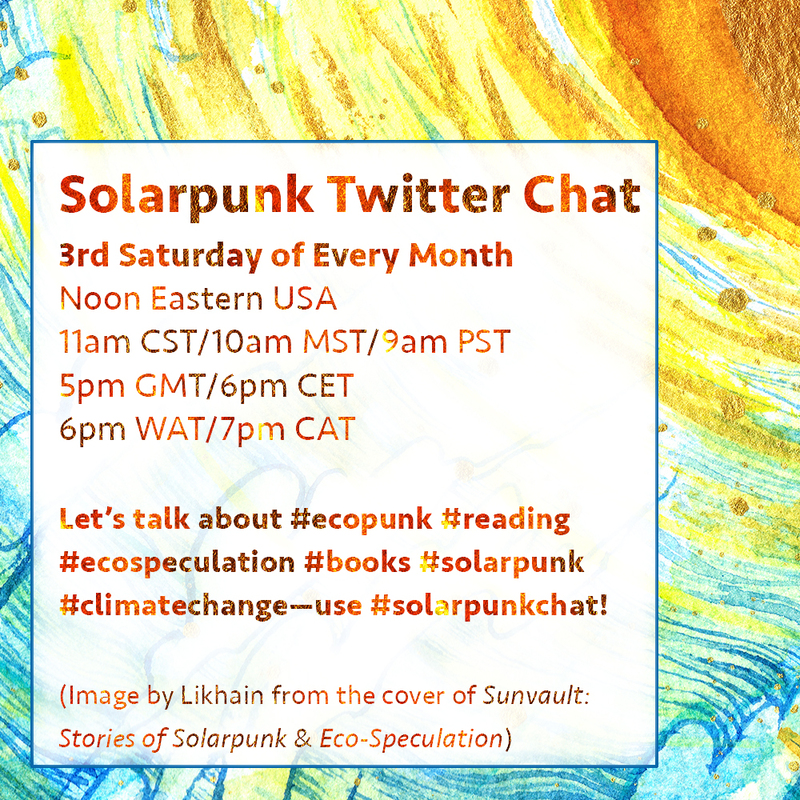 Join us on Twitter at noon EST on March 17th by using the hashtag #SolarpunkChat and following this month’s hosts @michaeljdeluca and @B_Crilly, plus moderators from @upperrubberboot. In later months, we’ll continue to chat on the third Saturday of each month with other eco-focused special guests, like World Weaver Press, who are absorbed this month with planning for Glass and Gardens: Solarpunk Summers (which includes Sunvault‘s Jaymee Goh, as well as Wendy Nikel, Julia K. Patt, Holly Schofield, and many others). Entry filed under: News. Tags: Brandon Crilly, climate fiction, eco-fiction, eco-futurism, ecopunk, hopepunk, Michael J. DeLuca, Reckoning Magazine, Reckoning Press, solarpunk, solarpunkchat, sunvault, World Weaver Press.